Japanese retail market is most likely the most progressive market on the planet. Keeping an eye on the japanese market tendencies, you can interpolate its results for the rest of the world and approximately estimate the potential of other countries. Let's predict our nearest future on the flat panel displays market. The world has been recently experiencing a competition aggravation in the area of design and commercialization of new technologies in flat panel displays, which will replace LCDs on the market. Having started commercial manufacturing of electroluminescent full-color displays, the american Eastman Kodak company has recently joined to the fight for a place on the flat panel displays market, which had been previously dominated by japanese companies and their successful plasma-panel displays. "The picture on an EL-Display remains clear, even if you look at it cornerwise", said Yosikazu Hori, president of Kodak Japan Ltd., on the press conference conducted on March 2003 together with Sanyo Electric Co. In case of digital camcorders with LCD constituting the majority on the flat panel market, colors on the display will change when you look at it at an angle. Full color organic electroluminescent displays (OELD), which Kodak and Sanyo launched into production in 2003, do not have this LCD drawback. OELDs also have other advantages over LCDs. In particular, OELD screen is a surface covered with luminescent dots, each dot is several dozens of microns in diameter. Due to them OELD, unlike LCD, does not require back lighting. This feature makes OELD very thin and bendable in every direction. In future these displays may be embedded into surfaces of any shape, including sleeves of outer clothing, which will fully accomplish the conception of "portable" personal computers, TV-sets, etc. "From the point of view of such characteristics as image stability and sharpness, OELD combines the CRT and LCD benefits", noted Tadahiko Tanaka, one of the CEOs in Sanyo Electric. Toshiba and Mitsubishi Electric corporations also launched color ELD prototypes. Hitachi Ltd. launched a production line for displays of this type and commenced probe manufacturing. According to the research of the american Display Research company, in 2002 the yield of flat panel displays in the world amounted 3 trillion yen ($25,6 milliard), more than 90% of this sum was constituted by liquid crystal displays (LCD). The segment of the next (after LCD) generation flat panel displays is in its forming stage and is dominated by plasma panels so far. In the nearest three years the share of new ELD is expected to rise up to 300 milliard yen, the share of plasma panels being not less than 1 trillion yen by 2006. PDP will bó mostly used in large TV-sets. In 1997 Pioneer Corp. was the first in the world to launch PDF TV sales and presently continues to develop their production. 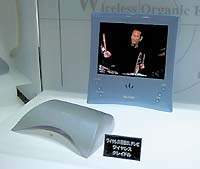 At the end of 2003, when Japan introduced digital television broadcasting, Pioneer Corp. entered the market with a new model of a digital TV-set with a plasma panel. To expand the annual POP TV output, in April 2003 Pioneer Corp. constructed a new plant at the cost of 30 milliard yen in the Yamanashi prefecture. At the end of 2003 Matsushita Electric Industrial Co., the largest manufacturer of consumer electronics in Japan, also launched a new POP TV plant at the cost of 60 milliard yen in Osaka. At present the Japanese PDP market is monopolized by the four companies - NEC, Fujitsu Ltd./Hitachi consortium, Pioneer and Matsushita Electric. PDP is a strategic product for these japanese companies, with which they try to restore their lost world leadership in flat panel displays. At the same time Asiatic competitors of the japanese companies take active steps to enter this promising sector of the displays market. In particular, south-korean Samsung Electronics is also gradually deploying its mass PDP manufacturing. In 2002 several japanese companies proceeded to active research and development of technologies for mass manufacturing of new flat panel displays based on field emission elements (FED - Field Effect Display). FEDs contain subminiature microvacuum lights, similar to electron-ray tubes, which are manufactured using nanotechnology methods and digital processing of light signals. For example, works in this direction are initiated in Toshiba and Canon. According to japanese experts, japanese electronic design companies will have to endure hard competition on the flat panel displays market, first of all with rival companies from Taiwan and South Korea. That's why their efforts in the nearest years will be directed to retain their technological breakaway from their PDP competitors, to look for new niches in LCD manufacturing, as well as to further OELD and FED development. Japanese company Sharp Corp. together with Microsoft designed Ultra High Resolution LCD for the next generation of computers under the new operating system Microsoft Longhorn, which launch is planned on 2005. The new display will render 1 milliard colors, unlike 16.77 million colors in modern high resolution displays. The new displays, according to their designers, will be demanded in such areas as scientific research, medicine, publishing, etc. They are also considering to design TV sets with such ultra high resolution displays, which are expected to be in demand because of the digital TV broadcasting planned to commence in Japan in 2004 and the further expansion of the HDTV broadcasting. Sharp Corp. is considering to sell its license on the production techniques for ultra high resolution LCD to other manufacturers in order to establish it as a new de facto standard in the industry. Sharp. Corp. and other leading manufacturers of flat panel displays are planning to double their investments into the means of flat panel display production to 200 milliard yen in the 2003 fiscal year as a response to the growth of global demand for TV-sets and personal computers. Drastic increase of investments into the development of flat panel display manufacturing is expected to make up for a considerable drop in the electronic companies' investments into the production of semiconductor microcircuit chips for the last three years. This is a result of the fact that flat panel displays, LCD or PDP, are the key products requiring huge investments (the main engine of the economic growth). Sharp Corp. successfully promotes on the market its 30" LCD TV set and in 2003 they increased their investments into the LCD industry to 108 milliard yen, which is twice more than in 2002. The new plant of the company in the Mie prefecture started a mass production of large LCD TV sets in the beginning of 2004, which allowed to double the yield. Hitachi Ltd. is the second largest company in Japan that manufactures LCD. The company is also preparing to launch a new processing line in Chiba for the mass LCD production. Matsushita Electric Industrial Ñî. has formed a joint enterprise with Toray Industries Inc. to manufacture PDP. The joint enterprise Matsushita Plasma Display Production Co. has started mass PDP production on a new processing line at the cost of 60 milliard yen. By the end of April 2004 they planned to increase the yield to 65 thousand items a month. Pioneer Corp. is planning to invest 16 milliard yen into the means of PDP production in their new plant in Shizuoka. NEC Corp. is planning to triple their PDP production volumes in the plant in Kagoshima. With this objective in mind they invest 27 milliard yen into the additional manufacturing equipment. In 2003 the joint venture Fujitsu - Hitachi invested 10 milliard yen into the manufacturing equipment and raised the monthly PDP production volume by 50% in comparison with the beginning of 2003. According to experts from Japan Electronics and Information Technology Industries Association (JEITIA), in 2003 the world market volume of flat panel TV sets was 2.5 million units, which is 1 million more than the last year. Transition from CRT monitors to flat panel displays was rather quick. From the experience of microelectronic industry we know that the product competitiveness directly depends on investments into manufacturing re-equipment. That's why the japanese flat panel display manufacturers, who expect hard competition from the companies in Taiwan and South Korea, greatly raised their investments into the development of the manufacturing capacity. Japanese manufacturers of electronic materials have actively joined the development of new polymeric materials for the ELD substrates. In particular, Sumitomo Bakelite Co., Zeon Corp. and JSR Corp. are planning the mass production of such materials in 2003-2004. The majority of modern OELD is manufactured on the basis of glass substrate. The transition to polymeric substrates in the nearest future, which will allow flexible displays, will expand the area of ELD usage. Sumitomo Bakelite developed a polymeric substrate for OELD with a very smooth surface (maximum size of irregularities not exceeding 1 nanometer). Before now only glass with its high surface homogeneity could be used for OELD substrates, but Sumitomo Bakelite managed to obtain a polymeric substrate with the identical to glass surface quality, but five times as thin as the glass substrate. In 2003 the company started to deliver test samples to display manufacturers. Mass production of the substrates will start in 2004 in the company plant in Amagasaki (Hyogo prefecture). The company plans to raise the yield of the polymeric material for OELD substrates to 5 milliard yen by 2008.
to use the recently developed polymeric material as a substrate in OELD manufacturing. The company is planning to complete the preparation to mass production of this material by the end of 2004, when a leap in OELD demand is expected. JSR Corp., a leading manufacturer of synthetic caoutchouc, also works on a polymeric material for OELD substrates. All the three companies expect that their polymeric materials for OELD substrates will be in high demand, because these materials will be used to create displays, which can be embedded into surfaces of any shape, including displays as constituent parts of clothing. Thus it'll be a step towards the so called Wearable PC - subminiature computers that can be put on like clothes. Despite the above mentioned advantages of OELD on flexible polymeric substrates, these materials still lose to glass substrates in their resistance to external factors, including the effects of moisture, temperature, and air. Besides, glass substrates are approximately twice as cheap as the polymeric ones. According to experts from Asahi Glass Co., to create competitive materials, the manufacturers of polymeric substrates will need extra efforts to raise the quality and lower the cost of the new materials. In spite of the fact that Eastman Kodak (USA) possesses many key OELD patents, japanese companies still have enough resources to ensure leadership in this direction, as the analysts say. In 1999 Pioneer Corp. became the first company in Japan that started OELD manufacturing (7,5 cm, thickness 0,2 mm, resolution 120x160 dots). It was followed by TDK Corp. , alliance NEC Corp. and Samsung Electronics (S. Korea) and RiTdisplay Corp. (Taiwan). In 2002 the global OELD market amounted 10 milliard yen. The main share was constituted by 1- and 2-inch displays for handsets and automobile control panels. However, the increase in sales is limited by a relatively short OELD life and by the low figures of conditioned output from the manufacturing process. One of the main directions of improving the OELD technology is to design new light emitting materials. Idemitsu Kosan Co. and Nippon Steel Chemical Co. are leaders in manufacturing polymeric materials with low molecular weight. At present they are conducting research aimed at considerable increase of longevity of these materials. They have already reached the operating time of over 10000 hours, but the Idemitsu Kosan research is aimed to obtain materials with service life over 30000 hours, and up to 50,000 hours and longer in future. Sumitomo Chemical Co. together with british Cambridge Display Technology design light emitting polymeric materials with high molecular weight, which can be used in flat panel large-format displays for TV-sets. Japanese electronic design companies are presently involved in hard competition to be the first to enter the OELD market (OELD is considered the next generation of flat panel displays, which will replace LCD). In this competitive activity japanese companies intend to return their lead on the flat panel displays world market, which was lost to south korean and taiwan companies in the LCD sector. In February 2003 Sanyo Electric started mass production of color organic electroluminescent displays together with its partner Eastman Kodak (USA) and was the first in the world to deliver these products on the market. Manufacturing is organized on the joint venture of the two SK Display Corp. companies located in the Gifu prefecture. OELD yield in this plant amounts 100 000 displays a month (in the equivalent of 2" panels). Another company (Sanyo Electric) in the Tottori prefecture also started manufacturing OELD at the end of 2003. The combined production yield in these two plants will be about 1 million OELD a month. Total investments to the mentioned above two plants amounted about 20 milliard yen. 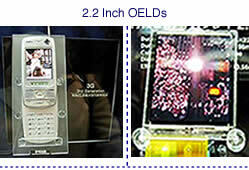 2,16" (5,4 cm) OELDs are designed for digital cameras and handsets of the 3-4 generation. Both Sanyo Electric and Eastman Kodak are planning to deliver OELD to other manufacturers. Sanyo Electric forecasts the volume of such sales by 2005 to be not less than 70 milliard yen, and Eastman Kodak - about 60 milliard yen. Both companies are planning to improve the technology used, especially in order to increase resolution and display area so that in future they could start manufacturing OLED TV-sets. TDK Corp. is also planning to start manufacturing color 5-7" OELDs, which will be able to render 64 colors. The production yield is expected to be about 3000 units a month, and the sales volume (by 2005) - about 10 milliard yen. 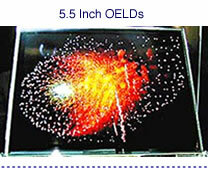 Hitachi Displays Ltd. designed 8.7cm OELD, which can render 260000 colors with 1:1000 contrast and brightness twice as high in comparison with OELD from Sanyo Electric-Eastman Kodak (and 10 times higher than that of LCD). Hitachi is planning to prolong the OELD longevity to 5000 hours. These panels will be used for PDAs (personal digital assistant). OELD manufacturing is planned to start in the third quarter of 2004 in a plant in Mobara (Chiba prefecture) with the initial yield of 10000 units a month. 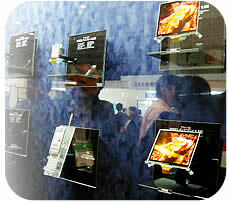 Dai Nippon Screen Corp. designed ultra thin OELD panel, which can fold as a sheet of paper. This design makes use of a technology from an english company Cambridge Display Technology Pic. Mass manufacturing of such panels will start already in 2004. By the end of 2004 the OELD world market volume is expected to reach 400 milliard yen. Mass OELD production by such manufacturers as Toshiba and Sony will be deployed in 2004-2005. According to the estimates of an american marketing company Display Research Inc., after all major manufacturers start full-scale mass OELD manufacturing, the world market for this produce will reach not less than 3.6 milliard USD by the end of 2005. By 2008 the world OELD market volume will amount about 1 trillion yen ($8.3 milliard). Japan Ministry of Economics, Commerce, and Industry is considering the deployment of mass OELD manufacturing as an important task for the national economy. In 2003 the ministry made a decision to allocate funds of 5 milliard yen from the state budget for the period of 2003-2007 to render assistance to the private sector to conduct technological R&D on OELD. Mitsui Engineering & Shipbuilding, Vieetech Japan Co. and Choshu Industry Co. proceeded to the development of production facilities for manufacturing large-scale organic electroluminescent panels in expectation of the demand leap for such equipment from japanese, taiwan, and south korean display manufacturers. Vieetech Japan possesses the chemical vapor deposition technology (CVD), which allows effective application of organic pigments to glass substrates. Choshu Industry has experience in manufacturing evacuated vessels and possesses equipment for substrate transference. Mitsui Engineering is one of the manufacturers of ionic implantation equipment. All the three companies are planning to pool their technological experience for designing complex integrated systems of manufacturing equipment in order to produce large-scale (37cm õ 47 cm) OELD. Delivery of this equipment is planned to start in the middle of 2004. In 2003 Mitsui and Vieetech Japan became joint owners of the plant and partners in the OELD manufacturing equipment. Prepared using materials of the Ministry of Foreign Trade.